In the past two years you haven't passed a bookstore that didn't have several copies of James Swanson's Manhunt: The 12 Day Hunt for Lincoln's Killer. In the next year Harrison Ford will track John Wilkes Booth across the widescreen. Soon Swanson's very readable and suspensful account will deserve a paragraph in any discussion of the Civil War in American popular culture. Along with The Spy Museum, The Newseum is among my favorite non-Smithsonian sites to visit in Washington D.C.
On Friday April 17 CWL joined 299 others in cleaning up the George Spangler farm at Gettysburg. The farm served as the Federal 11th Corps hospital and includes the summer outdoor kitchen in which Confederate general Lewis Armistead died. The other 299 were members of Tourism Cares which is an association of those working in the tourist industry as planners; the association exists only to provide historic sites with volunteer labor. In the past Tourism Cares has rehabilitated Louis Armstrong Park in New Orleans and a portion of George Washington's plantation at Mount Vernon. At the clean up event, Tourism Cares presented a $10,000 check to the Gettysburg Foundation which owns the farm. I am telling you that these tour planners and sales folk know how to plan reception. On Thursday evening at the Visitors Center I signed in, picked up a Yingling, lots of tender beef roast, roasted vegetables on a stick, another Yingling, more more roast beef. Then I found the desserts: cheesecake in cupcake papers and dark chocolate dipped strawberries. After have just gotten out of the car at the end of a four hour drive from Pittsburgh, I was ready to indulge. The registration fee for a volunteer was $99. I started to feel good about doing yard work in a National Park with these guys. On Friday morning, shuttle buses from the Visitors Center dropped us off at the farm which is located about a half to three-quarters of a mile due south of Powers Hill. Short saws, rakes and branch shears were distributed along with gloves. Three empty tractor trailer-sized dumpsters were filled by noon. Fence posts and wire fencing, cinder blocks, old farm debris, vines, and stones were cleared from the farm lane, the buildings, and the farm boundaries. The farm house and the sheads were cleaned out. The barn was not touched. The weather boarding is attached with square head nails and the entire building appears for the most part untouched since 1863. On Friday evening a reception was held at the Gettysburg Hotel on the square. I worked the food, beer and desserts fairly hard for about 90 minutes while enjoying a Civil War era dance band and then two guys in Hawaiian shirts, synthesized music and decent vocals singing Motown. About 8:30 I realized I had been sunburned that day and needed to cool down outside. I took a stroll over to a cigar shop and then up Baltimore Street to the Reliance Mine saloon to meet Jim Glessner of the American History Store on Steinwehr. Are you familiar with the saying, "Beer on whiskey, mighty risky. Whiskey on beer, never fear"? I live by it; so it was Jameson's neat for the rest of the night. With a group portrait of the Gettysburg Licensed Battlefield Guides over the bar and a stack of William Frassanito books on the shelf, I settled comfortably into a group discussion of where Farnsworth's Charge actually occurred. Then Bill Frassanito came in with 30 Batchelder maps and the evening became wonderfully suspended until about 1p. On Saturday morning I joined the Tourism Cares Association's bus tour of the battlefield with a licensed guide. Afterward I drove over to the Adams County Historical Society located in the famed Seminary building west of the borough and studied the society's files on the Spangler Farm. More to come later on the George Spangler Farm, Lewis Armistead and the 11th Corps hospital. 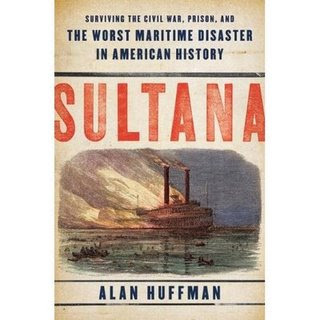 Sultana: Surviving the Civil War, Prison, and The Worst maritime Disaster in American History, Alan Huffman, Smithsonian Collins Press, 300 pp., bibliography, index, 2009, $26.99. In the past 20 years there have been six books on the Sultana, several magazine articles and one History Channel program. Huffman's effort, written in an engaging style, offers a somewhat unique point of view that both embraces and diverges from others' work. In Sultana Huffman personalizes the story in an unique way. Never fully removing himself from the story, there are frequent references to what science tells us today about starvation, exhaustion, brain functions, infected wounds, and survival in water of soldiers, prisoners of war, and victims of mechanical catastrophes. He uses the words of Civil War soldiers to illustrate his discussion and move the narrative forward. Where the soldiers are silent, Huffman advances the story with today's knowledge of the impact of personal catastrophes similar to those suffered by the soldiers. So frequently does the author offer the soldiers' words on events that CWL wishes that an annotated list of characters were in the book. Huffman's brings the reader to these engaging characters and then moves on leaving the reader wondering if a particularly interesting individual will be in the story again. Some are and some aren't. Not all the soldiers Huffman introduces are on the Sultana but they leave their remarkable story with the reader. Several Indiana soldiers often come to the fore, then step aside, intermittently return thereafter until the Sultana docks and begins to load Federal former POWs. There is just enough discussion of the Sultana as a vessel to move the narrative forward. CWL wishes that the ship itself would have been developed by Huffman as he had developed the soldiers. Also missing is any discussion of the possibility of Confederate sabotage of the vessel. North and South Magazine a few years ago published the story of the successful construction by Rebels of hollow coal filled with gunpowder. The North and South author, successfully in CWL's mind, found the possibility of Confederate saboteurs at both the explosion of a ship at Grant's Headquarters in City Point, Virginia and at the Memphis, Tennessee docks where the Federals embarked on the short fateful voyage. Also unfortunately the book has neither illustrations nor maps. It is certainly not the definitive (and CWL doesn't like that word at any time) telling of the Sultana. Huffman's accomplishment is that the soldiers are at the center of the story. Their experiences are those of brave men, some who endured and some who did not endure, passing through the rapture of war. 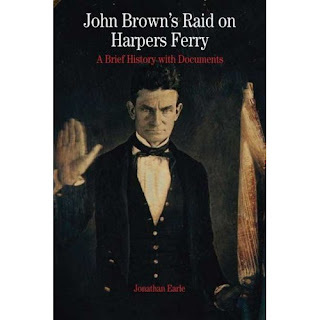 In his brief history of Brown and his raid, Jonathan Earle sketches the key elements of Brown's life, the political condition of the nation, the raid and the immediate responses to it. One historian has describe the responses to John Brown as being being in one of two categories. Brown was incompetent and a sociopath or Brown was martyred by slaveholders. Earle's work is among the best concise introductions to the event of 150 years ago. Brown receives a new biography about every 20 years. Recently, Stephen Oates' To Purge This Land With Blood and David Reynolds John Brown have done much to redeem Brown's reputation. Those biographies from the 1920s through the 1960 focus on the irrationality and religious fundamentalism of the man. As justice and race issues came to the fore beginning in the 1950s through the present day, Brown's life and crimes have been reinterpeted in the light of the issues of the 1850s and 1860s. Additionally, terroristic acts motivated by religion are more common today than Americans wish. Brown's understanding was that America was at war in the 1850s. The enslavement of about four million Africans was warfare against the Judeo-Christian God's desire for complete equality among all humans. Most abolitionists did not see Blacks, enslaved or free, to be equal. Abolitionists for the most part wished to do away with slavery but not inequality. Brown wished to do away with both slavery and inequality. By offering a brief history, 16 relevant documents, a chronology, a list of relevant participants, and 2 maps, Jonathan Earle's book is an approachable introduction that will probably generate an interest for further study and possibly a visit to Harpers Ferry National Historic Park. You Tube: "I Saw Lincoln Shot." I've Got A Secret was a very popular TV show that aired during the 1950s. This guest was a man who saw Lincoln shot. Samuel Seymour, 96 years old when this episode aired recalls Booth's fall and hoped that "the man who fell out of the balcony didn't get hurt." Seymour died a few weeks after the show. The cause of death was an injury received when he fell down steps at the hotel before the filming of this episode. Here is the You Tube link: I've Got a Secret has a Winston cigarette commercial included. The commercial boasts that "Winston tastes good like a cigarette should." On February 9th, 1956, 96 year old Samuel Seymour appeared as a guest on 'I've Got A Secret'. (The celebrity guest that night was Lucille Ball.) Mr. Seymour was the last surviving witness to the assassination of President Lincoln, and he was five years old at the time. He had gone with the family of one of his young friends. All Mr. Seymour remembered of that fateful and fatal night was that a man fell out of the balcony and onto the stage. It wasn't until after they had escaped the pandemonium in the theater did the little boy find out that the President had been killed. Mr. Seymour lived in Maryland and he died in April of 1956, 91 years after the assassination of Abraham Lincoln. News---Historic Guiding Without A License? A Free Speech Issue? Philadelphia Tour Guides Say Licensing Quiz Treads on Them, Barry Newman, Wall Street Journal, March 30, 2009. Ben Franklin's 80 Progeny and Other Myths Raised Hackles; Now It's a Federal Case. When in the course of human events, some tour guides are caught saying things like "Ben Franklin had 80 illegitimate children," the City Council shall force every tour guide in town to take a history test. Whereupon, some of the guides will pursue the blessings of free speech. In court.Case in point: Ann Boulais, tour guide and plaintiff. "Who can tell me why they decided to write the Constitution?" 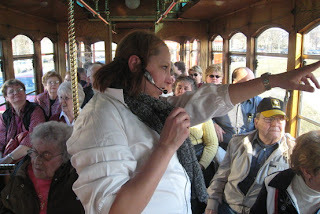 Ms. Boulais asked a trolley-load of tourists near Independence Hall one afternoon. "What's it there to protect us from?" When no one spoke, Ms. Boulais offered an answer of her own: "How about ourselves?" The "ourselves" Ms. Boulais has had uppermost in her mind of late are her city's own elected leaders. A year ago, they made it illegal to talk about history for money in the city center without a license. Feeling tyrannized, Ms. Boulais and two fellow guides summoned the constitution's protections by suing the city in Philadelphia Federal court. The history test, they claimed, breached the Bill of Rights -- a set of rules, as any good guide should know, that took effect while Congress sat here at 6th and Chestnut streets, on Dec. 15, 1791. A guide who wanted a license would have to know the answers to 65% of 150 questions about the city's historic sites. But the before testing could begin, the court granted the guides an injunction. That has left the test suspended for months in what scholars view as a fuzzy zone of judicial disputation over freedom of speech. The city, in its court filings, calls its law "an economic regulation" that has only an "incidental effect on speech." It notes that New York and Washington have similar rules. The guides point out that another crucible of revolution, Boston, has no such law, and note that speech is anything but "incidental" to a guided tour. "America," says Mike Tait, a tour guide and one of the plaintiffs, "was founded by people who stood up and said to the king of England, 'What you're doing isn't fair.' That's pretty much the same thing here." Except that the Philadelphia tour-guide rebellion's bête noire is Ron Avery, another tour guide. Mr. Avery, a 67-year-old former newspaper reporter, writes books ("City of Brotherly Mayhem: Philadelphia Crimes and Criminals") and fills file drawers with Philly ephemera. A few years ago, he took a bunch of tours himself and came away convinced, he says, "that maybe 50% of the tour guides didn't know what the hell they were talking about." Of the flubs he overheard, Mr. Avery compiled a list of 91 beauts (including the one about Ben Franklin's progeny). A sampler of egregious Washingtoniana: George Washington is buried in Washington Square; he once lunched with Abraham Lincoln at Powel House; the equestrian statue near the Philadelphia Museum of Art is actually Frederick the Great with George's head. A tour guide, Mr. Avery feels, cannot tell a lie. He showed his list to the City Council, and it unanimously agreed. History is so central to its "branding, messaging and identity," Philadelphia says in its court briefs, that its millions of visitors must be sheltered from "a great proliferation of misinformation." "The idea is a basic test -- no trick questions," says Mr. Avery. "It would force guides to study a little. What's the big deal?" Listing Philadelphia's "firsts" (revolving doors, root beer) she cited Bassetts as "America's oldest ice-cream company," omitting that it was founded in New Jersey. At Congress Hall, she said the Senate is the "upper house" because "it met on the second floor," a notion the Senate Historical Office deems incorrect. Stuck in traffic on Market Street, Ms. Boulais did put one fallacy straight: "When was the Declaration of Independence signed?" she asked. A man in back yelled, "The third," and she took his cue to explain that it was "ratified" on the Fourth of July, 1776, and printed on the sixth, but that the signing didn't start until Aug. 2, and wasn't over until 1777. "That's a much better story," she said. As her tour ended, Ms. Boulais briefly told her tourists about Philadelphia's license test and her view of it. Slipping her a tip on the way out, one of them hugged her and said, "Fight 'em!" That's how lawyers reacted at the Institute for Justice, a libertarian Washington law firm that up to now has mainly fought against licensing of hair braiders and casket salesmen. As Robert McNamara, a lawyer who took on the case, distills his argument, "Government can't make sure you understand the Constitution before it has to abide by it." Tour guides, Mr. McNamara says in his briefs on their behalf, aren't like accountants, who say things people act upon. A license, he argues, would restrain the content of a guide's spiel because speech alone is at issue; leading a group "while entertaining them with show tunes" wouldn't require a test or a license. He proposed an optional test, but city officials (who declined to comment on the litigation) said no. If Philadelphia can license librarians, its briefs say, it can make sure guides are "capable of knowing something about what they are selling...." Once tested, it promises, guides can say whatever they please -- that Benjamin Franklin "should not have believed in natural rights, or anything else." With the trial date due to be set on April 7, First Amendment experts can't call the outcome. "There's no apparatus for judges to figure out what they're doing in this area," says Prof. Robert Post of Yale Law School. On one point, though, there is no debate: Even if the city can't control what's said outside the nation's birthplace, the federal government can dictate what's said on the inside. Tours of Independence Hall, with its Windsor chairs and quill pens, are run by the National Park Service. A park ranger was in its Assembly Room not long ago, holding up a copy of the Declaration of Independence for a group of tourists. "The signing takes place in this room," he was saying, "on the second of August 1776." His talk over, he stood at the door inviting questions. Wasn't the signing completed after Aug. 2? "Some people did come and sign later," said the ranger. And what did he think of the Philadelphia tour guides' lawsuit? "Ludicrous," he said. "People come here to get the truth." The ranger asked not to be quoted by name. Under park service rules, he wasn't authorized to speak. Did the unlicensed guides make mistakes? A Tour Guide's List of Mistakes. See an interactive map of some of the flubs made in tours of Philadelphia. Text and Image Source: Wall Street Journal March 30, 2009. Legislature Honors Reconstruction Era Lawmakers, Associated Press - March 26, 2009.The Alabama Legislature has passed a resolution honoring black lawmakers who served during the Reconstruction era following the Civil War. The resolution by Democratic Rep. Alvin Holmes of Montgomery says black Alabama residents played an integral part in the Legislature from 1868 to 1878. 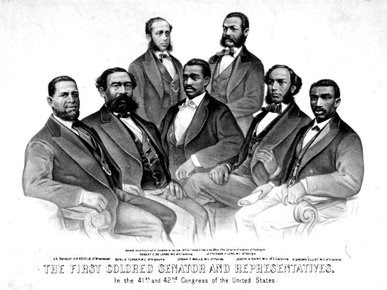 At the height of Reconstruction in 1874, there were 33 blacks in the Legislature. Holmes' resolution received final approval Thursday when the House went along with changes made by the Senate. The resolution now goes to Gov. Bob Riley for his approval. The resolution calls for the names of the black lawmakers to be placed on plaques located in the rotunda of the state Capitol, on the grounds outside the Capitol and inside the entrance to the Alabama Statehouse. This 1872 lithograph by Currier and Ives depicts the African Americans elected to the 41st and 42nd Congress during Reconstruction. Alabama representative Benjamin Turner is pictures second from the left. Confederate Holiday Provokes A War Between The Souths, Dahleen Glanton, Los Angles Times, March 28, 2009. In a cultural war that has pitted Old South against New, defenders of the Confederate legacy have opened a fresh front in their campaign to polish an image tarnished, they say, by people who do not respect Southern values. With the 150th anniversary of the start of the Civil War coming up in 2011, efforts are underway in statehouses, small towns and counties across the South to push for proclamations or legislation promoting Confederate history. Alabama, Virginia, Mississippi, Texas, Louisiana and Florida observe Confederate History Month in April. Georgia has recognized it by proclamation since 1995, and the state Senate recently passed a bill that would make it official -- assuming the measure passes muster in the state House, which could be problematic. Most Southern states recognize Confederate Memorial Day as a legal holiday. Some celebrate it on the June birthday of Confederate President Jefferson Davis, but Texas and Arkansas observe it on Jan. 19, the federal holiday for the Rev. Martin Luther King Jr.
More than a thousand municipalities hold parades and festivals on the holiday, said Charles McMichael, commander in chief of the Sons of Confederate Veterans, and efforts are underway to spread it nationwide, state by state. "It has been our experience over the last 30 years or so that when the Confederacy is addressed at all historically, it is done in a way that serves a political agenda. . . . We want the truthful history about all aspects of the Confederacy told," McMichael said. "There are some good things that you can learn, and we think there are more good than bad." But for many Americans, the Confederacy evokes the atrocities of slavery. The negative image has long angered some white Southerners, particularly those whose ancestors died in the Civil War. In their view, the war is a source of Southern pride. In recent years, they have sought to redefine the Confederacy in multicultural terms, saying that Jews, Latinos and blacks fought for the South. They argue that the war had little if anything to do with slavery. And they've become vocal in opposing white supremacist groups that use the Confederate flag as a symbol of hate. "Slavery is a part of American history, not just Confederate history," McMichael said. "The Confederacy has gotten a bad rap because we ended up on the losing side and therefore the wrong side of history." But that multicultural interpretation is dubious, one historian said. Commemoration of the Confederacy as a noble cause began shortly after the Civil War ended in 1865, said Jonathan Sarris, associate professor of history at North Carolina Wesleyan College. The multicultural angle is an effort to appear more inclusive, he said, but it ignores the facts. "To say that it is not racist but about multiculturalism is an attempt to adopt a modern mind-set," Sarris said. "You can call it a victory for the forces of multiculturalism when even the defendants of the Confederacy feel they have to pay some lip service to the idea of tolerance." Georgia state Sen. John Bulloch, a Republican who sponsored the bill recognizing Confederate History Month, said the observance would help tourism, particularly in areas with Civil War battlegrounds. It is no different, he said, from Black History Month. But Georgia state Rep. Tyrone Brooks, a Democrat and longtime civil rights leader, said the South has lagged behind the nation by trying to hold on to the past. He said the bill will face opposition in Georgia's more diverse House. "These Southern states really still have not come back into the Union," he said. "That is why it's been so difficult over the years to get the states to recognize that flying the Confederate emblem on the flag, holding reenactments and pushing these calendar events as a matter of law is a reflection . . . of their Confederate mentality. "This is a new day," Brooks said. "The Confederacy lost, and the majority of the American people will not accept these ideas about a renegade group of folks who decided they would overthrow the U.S. government." 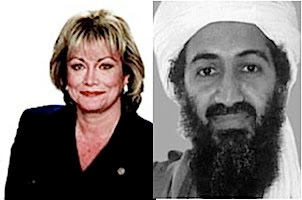 Congresswoman and soon to be Undersecretary of State Ellen Tauscher (D-Alamo), shocked national and international diplomacy and fashion circles today when she announced she would wed Osama bin-Laden in a wedding to be held at a secret location in Nairobi this June. Supporters were elated for the couple and were relieved that the secret was finally out as a 2-year tryst between Tauscher and bin-Laden was about to be exposed on Entertainment Tonight. “This is the reason Ellen was named to State,” said a source close to the couple. Indeed, President Barack Obama has agreed in principle to name Tauscher as a special envoy to al Qaeda in the hopes of reaching a detente with Fascist Islamic terrorism. The happy couple plans to honeymoon at bin-Laden’s villa in Iran before they take up their trendy bi-mountain lifestyle; spending time between semi-permanent residences in a lavishly remodeled cave nestled in the hills overlooking downtown Kabul, Afghanistan, and a brownstone walkup in the rolling countryside of Pakistan near the Afghan border. The couple registered at Target and Penney’s.